Next up in our series of featured MBA bloggers is MBA Boy, author of the blog, “MBA Applicationland.” Please enjoy MBA Boy’s thoughtful answers and use them to help you make your way through the MBA admissions process. MBA Boy: I was born and raised in Massachusetts, before departing for college out-of-state in 2004. (I’m keeping the name of my college confidential during the application process, although I’ll say I’m a 2008 graduate.) Additionally, I wrote a post containing other juicy tidbits about my life entitled “Who Is MBA Boy?”. MBA Boy: Well, first off: I think I’m approaching the age where I have to make that decision of going back to school or not. If you look at the trend, most students at top MBA programs are under 30. I also think that, nowadays, people can get so detached from their jobs. They spend the large majority of their adult lives just going through the motions of their jobs, just doing things, because they have to – to get by in life, pay the bills, support the family – but mentally and spiritually, they’re slowly getting the life sucked out of them. And I don’t believe in that; I believe in calling. I believe everyone has a calling, and that it’s crucial for you to discover your calling and to pursue it, because it injects purpose into your life. See, I’m actually one of those oddballs who genuinely enjoys investment banking. (Yeah, I’m that guy.) But at the same time I don’t feel called to be a career investment banker; I see other opportunities where I can personally impact people more. And that’s something that’s really important to me. Some people are passionate about making a great product. Other people really care about innovation or getting rich or something else. For me, it’s all about people. I’m passionate about people. So it basically came down to, do I want to start thinking about my next job, or would I rather go back to school first? And I settled on going back to school, because I think it’ll provide a better foundation in the long run and prepare me for the things I want to do. That said, I’m also a very religious person, so ultimately I’m leaving the outcome in God’s hands. I absolutely trust that I will end up where God wants me to end up, even if it’s not at business school. Accepted: How important is a “name brand” MBA program to you? Are you only applying to top 10 programs? MBA Boy: Haha, I want to be careful here because I don’t want to equate applying to top schools with valuing prestige – even if that’s what a lot of people do. While I don’t know how you’d specifically define the “top 10 MBA programs,” the schools to which I am applying are all well-regarded. More importantly, though, I think they’re the best schools to help me achieve my calling. On the other hand, I’m not going to sit here and tell you I don’t think about the prestige factor at all, because I do. I think everyone does. Anyone who tells you otherwise is in all likelihood lying. But I’m wary of thinking about prestige, since prestige is really synonymous with pride, and pride is a very dangerous thing. So whenever thoughts of prestige arise I make sure I squash them, because if that’s why I’m going back to school, then I’m just doing it to feed my own pride. Accepted: Would you consider applying to a b-school outside your current country? MBA Boy: I’ve already finalized the list of schools I’m applying to, so I can answer with certainty that I’m not considering any schools outside of the U.S. I studied abroad in London for a semester and absolutely adored the city, but it probably makes the most sense to stay in the U.S. if I’m planning to work here. Accepted: How many times did you take the GMAT? Are you happy with your score? MBA Boy: I took the GMAT once, scored 760, and was satisfied with it. I think it’d be rather bratty for me to say I got a 760 and it’s very upsetting. If you’re interested in reading more about my GMAT journey, I dedicated one and a half decently long posts to it in my blog. Accepted: How has the current economy affected your decision to attend business school? MBA Boy: To be honest, not at all. MBA Boy: I love writing, and it’s a beautiful thing when you’re able to express yourself eloquently through words. I used to jot down random musings about my day, which eventually turned into an obscure blog with an ebullient fanbase of seven or so. Unfortunately, I’m not a terribly fast writer and I just couldn’t find time to keep writing, so I stopped. One night in August, as I was contemplating essay ideas for my applications, an exquisite inspiration came upon me and I wanted to commemorate the moment in words somewhere. All of a sudden, I found myself blogging again. And so really, I’m just finding an excuse to do something I love; if others can draw inspiration from my writing, even better. 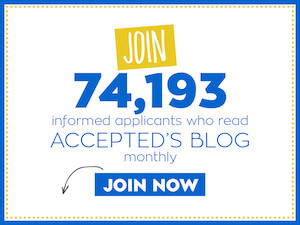 Do you want to be featured in Accepted.com’s blog, Accepted Admissions Blog? If you want to share your MBA journey with the world (or at least with our readers), email us at mbabloggers@accepted.com.